Benton County road crew at work on the Robin Hood Lane widening project on May 23. Public Works Directors Josh Wheeler of Benton County and Jeff Blaine of Albany reminded me of an agreement between city and county to transfer several county roads to the city’s ownership and jurisdiction. The agreement calls for those streets, Robin Hood among them, to be improved before the transfer takes place. The work started last week and continued today. Later, in the summer, the street will get a two-inch pavement overlay. 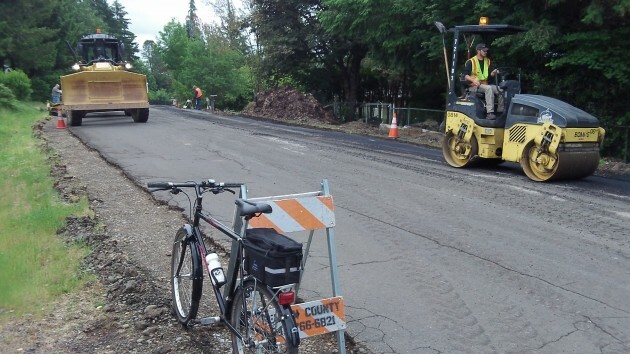 According to Blaine, the city is interested mainly in the new pavement because it would like to avoid having to spend big sums on maintenance as soon it takes over the street. According to the intergovernmental agreement, the street is being widened to about 26 feet. “The widening was included in case that was something that the neighborhood wanted,” Blaine wrote. If the neighborhood had not wanted the wider street, he added, the city staff would have been OK with just the overlay. I asked Wheeler what the county is spending on the Robin Hood alterations. Between $125,000 and $150,000, he replied. Consult your AP style guide. Always a good idea, but for what? A BIG thank you to the Answer Man! Are Gibson Hill & Crocker included in that basket of roads scheduled for transfer to Albany ownership?